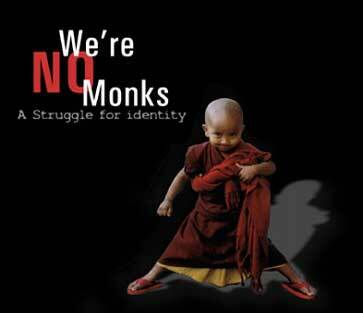 Tibetan filmmaker Pema Dhondup’s “We are no Monks: A Struggle for Identity” is an important film. The last the Tibetans saw themselves on the screen, in all the scorching palettes of their oppression under the Chinese occupation, was eight years ago in Paul Wagner’s “Windhorse”. About three young Tibetan siblings in Lhasa coming to grips with their identity and their throbbing pain for freedom, the film ends, after the nun-sister having died from Chinese torture, with the singer-sister and their brother, his heart melancholic and furious, trekking over the Himalayas to India. Theirs is an uncertain road to freedom in exile. “We are no Monks”, currently in its distributing-searching phase, makes complete the metaphorical circumambulation. The trek here is from exile to freedom! But first a nod to the other Tibetan films in between: two Hollywood biggies and one Cannes favorite. Martin Scorsese’s “Kundun” was a sumptuous meditation on the life of the Dalai Lama. But for all the hype, it was a yet another cinematic experience in unraveling the enigma and making real the person. So it was fitting that after the world had savored this most uplifting of biographies, its coming roar over a nation’s tragedy would stop short at a guilty burp – and a few rounds of applause. John Jacque Annaud’s “Seven Years in Tibet”, on the other hand, was all about Brat Pitt. What was essentially Heinrich Harrer’s sweeping chronicle of the fragile grandeur of the Tibetan nation was now a modern man’s personal tale of redemption, the coming ruins of an ancient culture serving a convenient foil to his troubled sense of destiny. Then there was the remarkable “The Cup” by a first-time Bhutanese director Dzongsar Khentse Norbu Rinpoche. The film was a true testament to the universal language of humor and humanity, told through the story of a group of monks and their fascination with soccer in some remote monastery in India. Just as last year’s Korean surprise, “Spring, Summer, Fall, Spring”, the film endorsed the power of spiritual tranquility when applied to cinema, this time the undercurrent being one of Tibetan Buddhism of which the director is a leading reincarnate Lama. “We are No Monks”, as the title suggests, is not about monks. It’s not also about behaving like monks or being perceived to be like monks, or any other version to the Tibetan stereotype there is in between. The film tips on its end the fragile kaleidoscope of Tibet’s political tragedy, more particularly the exile experience, and asks of the audience these important questions: will the Tibetan freedom struggle turn violent? Will there be Tibetan suicide bombers? For a first feature film, Pema Dhondup has done a great job. Early on in the movie, there’s a scene in which an Indian police officer and a constable raid a local joint and in the course of their interrogation the officer shoves his baton into the mouth of one of the gathered Tibetan youth. This is a wide-angle shot and a crowd of heads blocks the action. It’s only when the heads gradually move away that one actually gets to see this police brutality, just as in real life, from a safe distance, without the convenience, or the hazard, of a “close-up”. And the man, who’s being tortured for information about recent robberies, himself one of the leading characters, is actually mute; his sign language is not the universal kind but his own, as would befit the dislocation of his identity. Such forms of subtlety and symbolism abound in this movie. The overarching style is one of gritty neo-realism which Dhondup employs effectively to hold together such sprawling tangents as youthful angst, failed fatherhood, broiling revenge, and confused loyalty: toward one’s country, lost yet not forgotten, toward one’s idea of self, familiar but still strange. The film’s layered look, its narrative within a narrative, somewhat brings to mind such original works as “City of God” by Fernando Meirelles. Four young Tibetan friends go about their lives in Dharamsala in India, seat of the Dalai Lama and an exile Tibetan community, guzzling beer and getting high on Marijuana, and whenever a bus would plant in the bustling marketplace a pretty young foreigner, they’d practice on her their womanizing charm and Indian-accented English. “You can’t miss anyone here, unless you’re a hermit or you live in a monastery,” the twenty-something Tenzin tells one such woman, this time an American. At other times which is almost always, the four men nervously skirt around charges of involvement in a spate of robberies, the investigation for which is being led by a thuggish Indian cop, Shamsher Singh, played by Bollywood baddie and the only professional actor, Gulshan Grover. The way the local cop unrelentingly trail the Tibetan men, his authority spelling intimidation, harassment and humiliation, it somewhat serves a faint metaphor for the Chinese oppression of the Tibetan people presently saved the four friends on account of their exile reality. Tenzin, played by Sonam Wangdue, is an unemployed graduate, a typical Dharamsala youth dreaming of going to America, spurning all attempts by his Tibetan administration-employed father to join the exile ranks. He’s the wisecrack, the Casanova, a fleeting soul forever looking for mischief. Tsering, enacted by Sonam Phuntsok, is a doting father of a girl child, his wife now living in America with another man, and who, because of his drifting ways, is obstructed by his unfeeling father-in-law from getting close to his sick daughter. Passang, played by Tsering Bawa, is from Tibet. All rage and intensity, Passang spews talks of revenge and violence against the Chinese government, his entire family having been a victim of Chinese brutality as shown in flashbacks and in a moving reunion with his persecuted sister. He’s also given to writing plays and lecturing his friends on the complacency of exile Tibetans. The fourth angle to this quartet is the mute guy, Damdul as played by Ngawang, who during the day sells bread from a roadside. What he lacks in the facility of speech, he makes up with his camcorder, which he routinely points at his friends, sometimes to their chagrin, and at events unfolding around them, as if he were God himself taking it all in, without judging, without speaking. Damdul and his camcorder lend this film its “narrative within a narrative” element, capturing as he does within the recording frame of his equipment perhaps some of the most important scenes. Like for example the opening shot when Tenzin speaks directly into the camera, and by default to the audience, after he’s pompously straightened his shirt collar and asked of his mute friend: “tha yin Pe (are you ready?)”. “It’s been fifty (sic) years in exile now. What have we gained? People are still being killed in Tibet. More refugees come out every year. Destruction continues even today. What has the world given us?” A long pause during which the actor, Sonam Wangdue’s face contorts into a grim resignation. “Only empty sympathy! Every person, every nation lives for his own, its own. This is a selfish world, my friend. If you want something, you have to struggle for it yourself. Even if it means putting your life on the line!” Then he launches into a tirade against the hypocrisy of the US-led War against Terrorism, the coalition’s hoodwinking of real genocides taking place in countries such as Tibet while making of their justice-cause a slave to the hard currencies of oil and global hegemony. This dialogue, if one knew well the Dharamsala situation, could come from the mouth of any young Tibetan there. For all the angst and the rage, what is noticeable is the way Wangdue’s character mixes up the number of years that’s lapsed since the Chinese takeover of Tibet, which is forty six not fifty, and this ambivalence, a sheer ingenuity on the part of the director, drives at the very reality of many young Tibetans across the exile landscape. 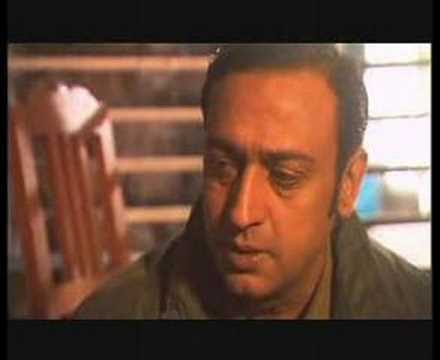 The actors are all culled from everyday inhabitants of the hillside-town, except for Gulshan Grover who delivers in this movie a truthful performance over and above his kitschy Bollywood arc. The realism extends to even such minor actors as the Tibetan lady whose character trades local gossips like “those Tibetan junkies from Shiva Café have got to be behind these robberies” and who, on days other than this when there’s no camera around, would still be fanning such local scandals, with a zest matching her feverish rosary-twirling. Those familiar with the town’s vagabond corners will be surprised to see one of its deadliest drifters, Dobdob, the sort of guy who’d rather duke it out with fists and blood than mere words, making his brief cinematic appearance – dressed in a black suit and looking all important – as a local authority; in fact, he gets to lecture somebody on how to conduct oneself in the greater scheme of things! The film renders no soft edges to the brutality, psychologically or physical, that resides both at homes and on the streets of Dharamsala, as elsewhere in India. Grover’s cop uses his baton more than his words, and his punches fly at every given whim. Upon returning home drunk one night, Tenzin finds his family – his father, his mother and his grandmother – waiting on him and when his frustrated father begins to berate and beat him for his waywardness, the son strikes a fighting posture: “I’ll kill you! Come, dare hit me if you can!” And as it happens in most homes, the women shriek and plead sanity, clutching their hearts, pulling at their men. The film is mostly shot with a handheld camera, giving it its life-like jolts and jitters. The only static shots are of two props: a TV set in the local joint and a computer monitor at an internet café, where Tenzin often whiles away his time plotting his escape to America in the Chat-room of Tibetsearch.com. In a remarkable turn of feature film meeting documentary, the scene of a large Tibetan crowd awaiting the Dalai Lama’s convoy was shot during an actual occasion; for a fleeting second, one gets to see the Tibetan leader, all smiles and waving his hand, before his car zips past the frame. The question still lingers in the form of suspense as the film unfolds; throughout the friends’ individual narratives, intersecting at certain points and diverging at others; and as the scenes jump back and forth. So much so that it envelops the initial dilemma of whether the characters were really behind the local robberies, for which their tragedy had seemed certain, the ringmaster being the brutal cop, and in its place, the audience is now left bracing for something more horrible, unimaginable even: what is personal is now national, the gathering storm of tragedy is as much ours! And when the violence finally happens it comes from the most unlikely quarter: a cinematic roll of dice which finds its real inspiration in the first exile martyr, Thupten Ngodup, a hitherto unknown face who in 1998 had blazed into the Tibetan consciousness with his shocking act of self-immolation at a Tibetan hunger-strike site in Delhi, India. It won’t be giving away too much to say that the suicide-bombing scene in Delhi is a brilliantly imagined segment. But what’s more emphatic of the exile Tibetan experience, the raging conflict of politics versus spirituality, is the young martyr’s voiceover toward the end: “I’ve not done this for anyone else, but myself. Tenzin was right: ’I’ is the important word here.” One can almost weep at these lines! The film’s rough-cut, as was shown to this writer, is bit too long at around two hours. A couple of scenes, particularly a party scene, seem to just drag on. With narratives spooling out in layers, the film could use a tighter editing. The film’s main weakness, however, seems to spring from the filmmaker’s own philosophical ambiguity, almost trepidation, about the possibility of violence in the Tibetan struggle, as opposed to his artistic imagining. That, along with his implicit bid for political correctness, somewhat dilutes its cinematic integrity. But that didactics is finally also the filmmaker’s message, born by his sense of responsibility, his moral callings. Here he treats the difficult line between being a cinematic arbiter of his nation’s unfolding tragedy and an artist on his own.